Modular MARVEL Mailroom Workstation lets you outfit your entire mailroom with the shipping table and mail storage center you need to fit your business. High pressure laminate worksurface with radius corners offers plenty of room to sort mail or weigh packages. 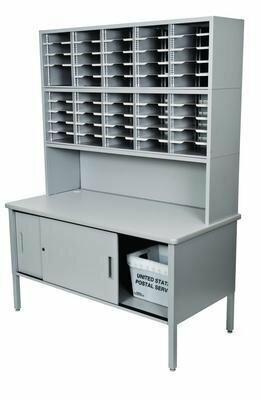 Riser, cabinet, and mailboxes are made of durable steel for long-term reliability. Available with either open storage shelves or locking cabinet that keep valuable supplies safe. Adjustable legs places the worksurface at optimum working height. Leveling glides steady unit on uneven floors. Free Delivery! In the Continental U.S.